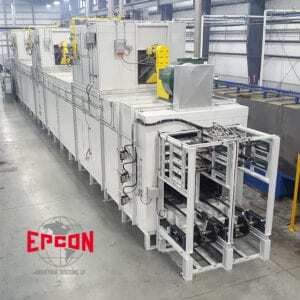 Epcon has been supporting finishing systems for facilities performing tasks such as cleaning (wash lines – multi-stage washers), painting and coating (paint booths) and curing (industrial ovens) for over 40 years. Epcon has perfected the use of its technology, components, and engineering experience for manufacturing air pollution control equipment in creating industrial finishing products that take advantage of our patented heat recovery systems. The biggest benefit of integrating a finishing system into your thermal oxidizer, industrial oven or other air pollution control system is using recovered or “waste” heat from these processes to perform tasks such as heating the water in a wash line system, creating the perfect environment for properly coating the items in an industrial paint booth, or generating the heat necessary in an industrial oven to dry off, flash-off or properly cure the items within it. Directing the waste heat into these processes prevents you from engineering other solutions that provide the heat necessary to complete your task, resulting in considerable savings in fuel costs. Not only does recycling your waste heat reduce your operating costs, it also minimizes your environmental footprint. Using less fuel is always better for the environment, and why not make your thermal oxidizer or other air pollution control system do double duty? Epcon specializes in using our engineering know-how, practical “in-the-field” project experience, and cutting-edge technology to create complete solutions to your finishing system needs. Creating one crafted, engineered solution is much better than creating two (or more) separate systems to get the results you are looking for. Epcon has a 250,000 square-foot facility dedicated to designing, fabricating and testing complete finishing system solutions on site, before installing them at your location, to assure that the process goes smoothly with as little disruption to your operations as possible. Our vast design experience across industries such as pharmaceuticals, powder coating, automotive, chemical and many more, benefits you directly because if you have an engineering challenge with your finishing system, chances are we’ve seen it before, and can put that know-how and experience to work for you. Need Help with Your Industrial Finishing Products? Contact one of our industrial finishing system experts at (936) 273-3300, email us at epcon@epconlp.com, or complete our simple online contact form, to get the information you need. With over 40 years of industrial finishing product design experience, Epcon knows how to design, create and test the perfect industrial finishing system for your business. ← What is a Thermal Catalytic Oxidizer?